Are all Yashinon Lenses 4 Element Tessar Types? The table below lists all the lenses fitted to both 66 and 44 models. The difference between the assumed number of elements in the taking lens and what I believe is the actual number should become clear as you read on (Yashica itself has confirmed that the 60 mm 44LM Yashinon is a triplet). Note 1: All taking lens apertures are f/3.5 except on the Yashica Auto 44 which is claimed by Sugiyama to be f/2.8. Note 2: I believe that all viewing lenses have 3 elements (explained further below). All lens serial numbers until probably just before the change to the new style focusing knob in 1956 were prefixed by “No.” after which time the prefix was dropped. All Lumaxar viewing lenses and all Yashinon viewing lens on Mats and Mat-LMs up to 1964 are prefixed by “View-” as in “View-Lumaxar” and “View-Yashinon”. The prefix seems to have been dropped at the time of the introduction of the Mat-EM. As far as it is known, all Yashica TLR lenses were sourced from the initially independent Japanese lens manufacturer Tomioka (although there is some controversy with the Lumaxars and contrary to claims of “exclusive lens supplier”, the evidence is that Yashica did source lenses from elsewhere for its initial cine and 35 mmm needs - see “Naming & Sourcing Controversies” further down). The business was founded by lens maker Toshioka Masashige in 1924 as Tomioka Kōgaku Kenkyūjo, or Tomioka Optical Laboratory (Camera-wiki.org), and started manufacturing in 1932 as Tomioka Kogaku Kikai Seizosho (“The Evolution of the Japanese Camera” by Condax et al, NY 1984). According to Wikipedia, in the early Yashima/Yashica period, the company was called Tomioka Optical and Machine Manufacturing Co., Ltd and according to Camera-wiki.org, it was called Tomioka Optical Instruments Manufacturing Facility but note the name on the first 1953 Pigeonflex above. In 1968, Tomioka was absorbed by Yashica and renamed Tomioka Optical Co., Ltd. in 1969. It became Kyocera Optec Co., Ltd in 1991 (Camera-wiki.org) and still exists today. 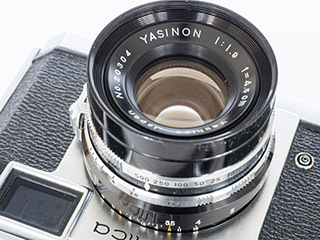 When Yashima introduced the Heliotar lens name on the Yashica Flex model S in 1954, reference to the lens ancestry on its TLRs disappeared for ever, however, the Tomioka maker name would make a reappearance on a couple of premium M42 SLR lenses at the end of the 1960s, one being the Auto Yashinon f/1.2 55mm seen on Yashica TL Electro-X brochures (this lens was also available from other camera makers as the Auto Chinon, Auto Cosinon, Auto Revuenon and from Tomioka itself as the Auto Tominon). Tomioka's “Tominon” name also appears on some versions of the Pentamatic wide angle and telephoto lenses but with “Yashica” rather than “Tomioka”. In 1973, Yashica licensed the “Contax” name (officially “CONTAX” from 1975) in a joint arrangement with Carl Zeiss. The first camera resulting from this partnership was the Japanese designed, Porsche styled, Contax RTS 35 mm SLR introduced at Photokina 1974. The Contax models were fitted with “Carl Zeiss” branded lenses. I understand that these were Carl Zeiss designs and that some were made in Germany and some (most) in Japan by Tomioka. I don't know the level of collaboration but it seems that Contax lenses made in either country are equally regarded - high praise indeed for Tomioka (and Yashica). 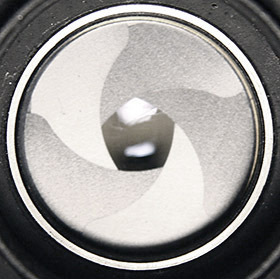 In both designs, the aperture placement (and shutter in the case of the leaf shutters used in TLRs) is after the second element from the front of the lens. From the outset, both Yashima taking and viewing lenses were simply called “Tri-Lausar”, either with or without being preceded by the Tomioka maker name in several forms as noted at the top of the Lenses section. Similar spec Tri-Lausar branded lenses were used by a number of other TLR makers as well but usually, the taking lens was named “Tri-Lausar Anastigmat” and the the viewing lens, “Tri-Lausar Viewer”. Whether these were the same as on the Yashima models is not known but very likely. The Tri-Lausars were followed by the Yashima specific Heliotar, Yashimar and Yashikor names. All, including viewing lenses, were 80 mm f/3.5 lenses. The Yashikor was certainly reputed to be an improvement over its predecessors but the real differences are unknown. These could be related to coatings, some tweaking of the lens formula or change in the glass. Some/all differences could simply be branding. The Yashimars, although of the same optical design, were undoubtedly offered as budget alternatives from the outset and may have been cheaper to make/procure for some reason, e.g. more basic coatings, or if the Heliotars were a real improvement over the Tri-Lausars, perhaps the Yashimar was simply a re-branded Tri-Lausar? Following the Pigeonflex, Yashima Flex and Yashica Flex B, the Yashica Flex S started with Tri-Lausars and went to Heliotars followed by Yashikors for subsequent top spec models. The Yashicaflex A series was a new and separate budget model range which started with Yashimars (the only models fitted with them) and these remained into the early Yashica A model run before they too were replaced by Yashikors. It has to be remembered that many of the cameras fitted with Tri-Lausars and Yashimars were basic cameras that have been unloved by subsequent owners. Given poor storage, some will no doubt be troubled by fungus, haze and other ailments. People looking for a cheap entry into medium format are likely to be harsh critics without sympathy for circumstances. I have seen decent photos (as much as you can tell from screen shots) on Japanese sites taken with all the triplets. Some commentators like to repeat the analogy between “Lausar” and “lousy”. I think that witticism is a little well-worn and a bit excessive for the reasons already stated. Also, 45 mm Tri-Lausars were fitted to some Pigeon 35 and Pigeon V models. Any triplet would have been a comparatively mediocre choice for 35 mm cameras in which application edge softness and aberrations would be greatly magnified and that certainly would not have enhanced the lens' reputation. From Tri-Lausar on the Pigeonflex to the first Yashikor was less than three years. Tomioka had many customers for various formats and in the beginning, Yashima would have been a small time player. Before computers, it took years to compute, develop and perfect new lens designs and even then they were usually based on what had gone before. Unless Tomioka had new designs sitting in the wings ready to go, I wouldn’t expect big variations in design or performance. Prolific maker Tougodo continued to use Tri-Lausar branded lenses on its various brands of TLR. If better Tomioka triplets were available, it is reasonable to expect that maybe one of the more advanced models may have been so endowed. Of course, Tomioka may have introduced minor improvements to its Tri-Lausar range that other makers didn't make a big deal about but Yashima saw as marketing opportunities for branding changes. However, this is simply conjecture. I have an open mind about whether any or all the differences were real or simply marketing. There are several interesting anomalies that may suggest something about Yashima lens naming. One was the Yashicaflex model C introduced in 1955 after the Yashicaflex model S had already changed from Tri-Lausars to Heliotars. This was the first model to feature the new Yashikor taking lens but uniquely, the viewing lens reverted to a Tri-Lausar. Even though it was around for another two years, the model S never changed to Yashikors. The model C sat below the model S with exposure meter. To me this suggests that either the Yashikor was simply the newer lens, or that Yashima was trying to further separate the two models by implying that the model S had superior optics, whether real or not (the budget Yashimar lens had been released only 9 months or so previously). The Tri-Lausar viewing lens is the first clue. After reading the section below on Lumaxar and Yashinon viewing lenses, is it believable that there would be any noticeable difference between Tri-Lausar, Heliotar and Yashikor viewing lenses even if there had been some minor tinkering? Why not just use the same name as on the taking lens? The second clue is that in 1956, Yashima produced the metered Yashica Hi-Mec model with the additional identifier, “Model S”, inside. This presumably was planned to replace the Yashicaflex model S. Whether a prototype or not, the Hi-Mec morphed into the Yashica LM. Even though the Yashikor lens was already on a production camera released in 1955, the Hi-Mec featured Heliotars to match the existing Yashicaflex model S but when released as the Yashica LM, the lenses were Yashikors and Heliotars were never seen again. Different Tomioka implementations of the established Cooke triplet formula, or marketing games? Not one to shy away from controversy, I have decided to include them in the hierarchy here before justifying their existence. If you read on, you will find incontrovertible proof that the 44LM Yashinons are triplets. 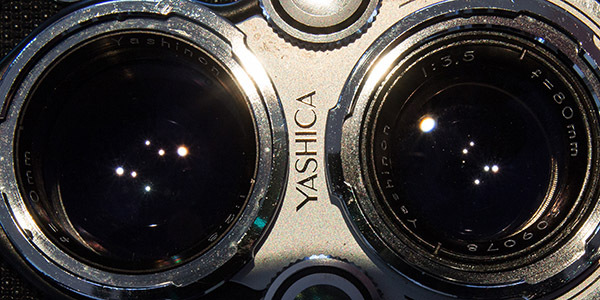 Also, the Japanese site TLR66.com seems to suggest that the Yashinon lenses on the Yashica Auto and Yashica E (both with lower spec f/3.5 viewing lenses) were rebadged triplets and so does Japanese Wikipedia regarding the Yashica Auto. Note, “Yashinon” is a brand name, not a formula like “Tessar” and the 35 mm range encompassed many different varieties and formulas under the “Yashinon” brand. In “Are all Yashinon Lenses 4 Element Tessar Types?” a little further down, I believe that tests (and also a correspondent in regard to the Yashica E) confirm that the Yashica Auto and E lenses are indeed triplets. Below that, in “Putting 3 Element Yashinon Taking Lenses into Context”, I consider Yashica's actions in the context of both its lens naming paradigm across its expanded camera range and also the question of whether it is reasonable to expect anything more than a triplet with these models. A new 4 element 3 group Tessar design was introduced with the first Yashica-Mat in 1957. This was called “Lumaxar”. The taking lens was f/3.5 with a focal length of 75 mm and only a little later in the same year, was replaced by 80 mm version (1957 confirmed by Japanese brochure and a Dutch ad from July 1957 already quotes 80 mm). 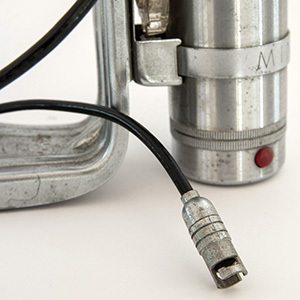 There was a name change to “Yashinon” in 1958 (according to my database and my understanding of serial numbers, the last Lumaxar 80 was made in December 1957 and the first Yashinon was made in July 1958, i.e., there was a 6 months break in production). The main advantage over the best of the triplet lenses was greater edge sharpness, particularly when used wide open. The level of improvement is no more and no less than expected when moving from a competent 3 element standard design to a competent 4 element standard design - there is nothing magical or mysterious. Nevertheless, the sourcing of the Lumaxar lenses is controversial. 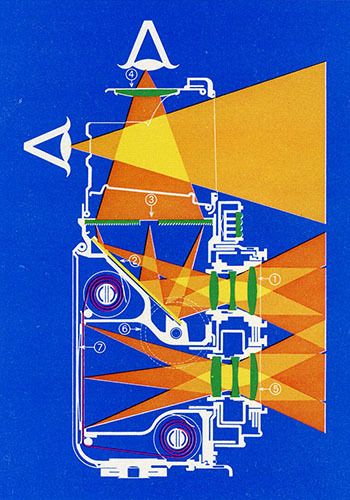 Tomioka's first lens, launched in 1932, was a 4 element Tessar type called Lausar (“The Evolution of the Japanese Camera” by Condax et al, NY 1984). Before the war, it was available in a number of sizes to suit different formats including the Proud plate camera (6.5x9 cm, 10.5 cm lens) and a number of Japanese “Semi” folders (6x4.5 cm, 7.5 cm lenses, either f/4.5 or f/3.5). There was also a 5 cm in a Leitz Elmar-like collapsible mount, most probably only for the 1937 prototypes of a 3x4 cm 127 format Leica copy (Camera-wiki.org). 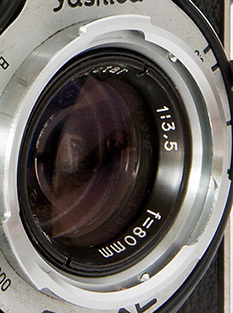 In a fixed mount, it appeared on several post-War 35 mm cameras. There are certainly Lausars, most probably still uncoated, which appeared on at least some early post-War 6x6 Elmoflex TLR cameras before Elmo standardised on Olympus Zuiko lenses. These Lausars are f/3.5 75 mm, just like the first Lumaxars. There was also a f/3.5 85 mm version used on several 6x6 cm folders. The Lausar was the lens that Tomioka staked its reputation on. The 3 element Tri-Lausar was introduced by Tomioka in the austere post-War period to fill the needs of the budget level mass market. It is my belief that the Lausar, with up to date lens coatings, became the 75 mm Lumaxar as a stop-gap measure until the 80 mm version was re-computed to suit Yashima's preference for the longer focal length. The Japanese manual, Yashica Mat Photography, was printed on 25 March 1957 and issued, or published, on 1 April 1957, the month of the Mat release. It already contains lens schematics featuring a 80 mm viewing lens and 80 mm Tessar type taking lens. There is no evidence to suggest any physical or optical differences between Lumaxar 80 and Yashinon lenses and it is likely that it was a name change only (see “Real Life Experience Below”). Reference to the well known book, “The Evolution of the Japanese Camera” by Condax et al, NY 1984, is often used on the net to refute persistent stories of the Lumaxars being sourced from Germany before Tomioka took over the production and called them Yashinons. It is claimed that the book says that all Lumaxars were made by Tomioka and that the change of name to Yashinon was caused by a conflict with a similar registered name in the UK when Yashica was allowed to commence exports. One suggestion was that the UK company involved was Wray. Their only similar lens name that I can find is “Lustrar”. Correspondent Terry Byford has pointed out that the company was more likely Corfield which used the names “Lumar” and “Lumax” for its Periflex camera lenses. I'm not saying that the threat of litigation didn't happen, I am questioning what the book actually says against what it is claimed to have said and whether it is a reliable reference as to the source of the Lumaxar lenses. Personally, I don't think it adds any value to the debate. It seems to me that someone has taken a little piece of general information from it and joined it with something else, source unknown, to make a sweeping statement - typical net behaviour. Note that the date of 1949 is also repeated by a number of others, all probably using this book as a reference. There is no evidence thus far that Yashima/Yashica made any cameras before 1953 (1949 was the year of incorporation of Yashima as a company). Also, the oft quoted “exclusive lens suppliers” claim is not sustainable. Yashica brochures accessible on the Brochures page feature Zunow cine lenses, one with even Zunow boxes on the cover. In Pentamatic Accessory Lenses, there is evidence that Yashica used the company later known as Tokina for at least the longer focal length T-mount Pentamatic/M42 lenses (second series, or “black nose” Pentamatic lenses). 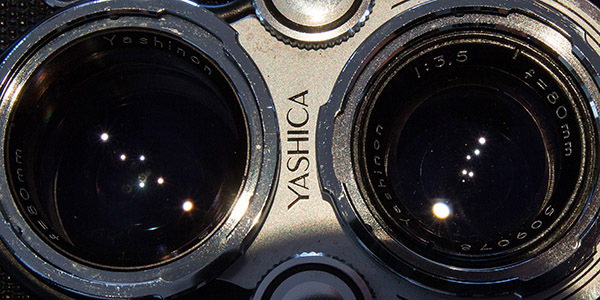 The Yashica YE & YF sub-page displays a Kyoei Optical Co., Ltd., 13.5 cm Super-Acall lens together with the visually identical Yashinon Leica screw (or thread) mount (LTM) version. The Super-Acall appears in a Kyoei catalogue with a portfolio of LTM and M42 lenses whereas Tomioka, according to the Kyocera website, didn't start making SLR lenses until 1960 and its LTM contribution is unknown, apart from unsubstantiated assumptions that it was “certainly” responsible for the Yashica YE Yashikor 5 cm f/2.8 and YF Yashinon 5 cm f/1.8 normal lenses. That may be correct but I haven't been able to find anything to confirm it. On the other hand, the only possibly reputable claim I am aware of in support of sourcing Lumaxars from Germany is, according to net sources (including Camera-wiki.org), by Mark Hama, the renowned Yashica technician who actually started work on the Yashica Mat-124G production line at the Yashica factory in Nagano, Japan, in around 1970 (pieced together from information on his website). That would make it at least 13 years after the Lumaxar period. Without any disrespect to Mr Hama, the photo on his site shows him as just one of many workers carrying out production line assembly tasks. On the other hand, he would later become Yashica's Service Manager in the US. The question in my mind is whether any of his roles gave him real knowledge of what happened in 1957? Note that there is no actual evidence offered that Mr Hama actually thinks that the Lumaxars originated in Germany let alone that he can confirm it. 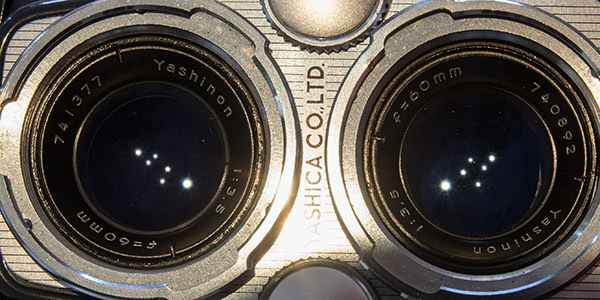 When Yashica began looking for something better, why not use the available higher spec Lausar? Why go to Germany for the same design (Tessar)? It has to be considered that Yashica based its success on outstanding value, not quality at any price. However, remember also that the opposing view is claimed to be put by a seemingly credible and reputable source. 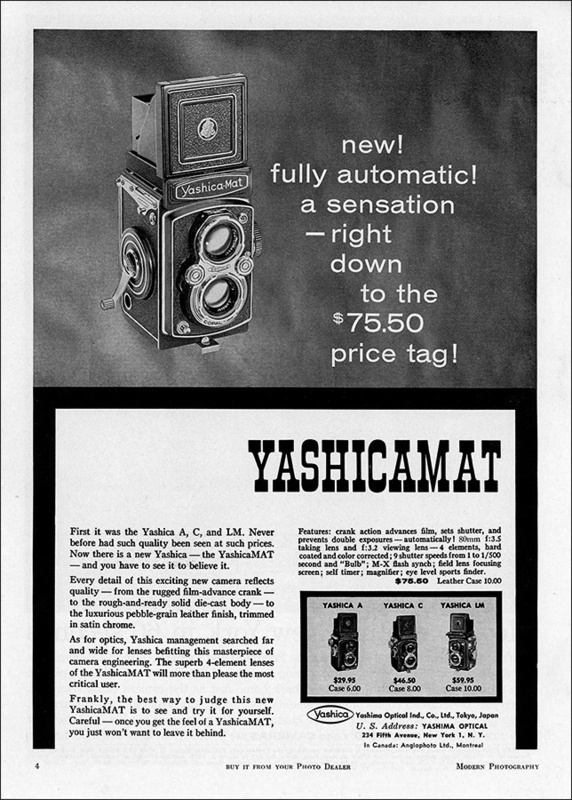 A 1957 US ad states that “Yashica management searched far and wide for lenses befitting this masterpiece of camera engineering.” Is that marketing speak, or did they really go beyond Tomioka? Of course searching far and wide doesn't mean that the final selection made was far from home. Choosing what seems like the more logical answer does not necessarily make it correct in terms of actual events. I have expressed my belief above but it is only that, based on my interpretation of the circumstances. Incidentally, I have attempted to do the obvious thing and write to Mark Hama but have received no response. If Mark Hama did in fact make such a claim, it is also possible that he was talking about the source of the Tessar design rather than the lens itself. These are my own thoughts. In all probability, the “Lumaxar” name was coined by Yashima, not Tomioka nor some other lens maker. It probably fitted in with the same marketing idea that had created “Heliotar” and initially sought to place “Yashikor” below it (see Triplets above). The “Yashinon” seems to fit into a family of lenses; “Yashimar”, “Yashikor” and “Yashinon”, all with a “Yash_” connection to Yashica. The Yashinon name first appeared on the lenses of the 1958 Yashica 8T-2 movie camera (an update of the 1957 Yashica 8 with turret and single Zunow lens) and 1958 Yashica 35 fixed lens rangefinder, not the Yashica-Mat as most TLR aficionados believe. These were released in the first half of of the year while Yashica-Mat production seemed to be shut down - see “Yashinon Naming Trivia” below. Linking all the lens names to Yashica would have made sense in terms of both consistency and brand awareness. In time, “Yashinon” became more of a lens brand than lens type. In the end, I don't think it makes any real difference whether the name change was a marketing decision or whether “Lumaxar” had caused trouble in the UK market, it was more or less inevitable from a marketing perspective. I have not found any Yashica-Mat examples and there may not be any. The serial number of the Yashica 35 suggests May 1958 production. Yashica-Mat production with 80 mm Lumaxar lenses seems to have stopped at the end of December 1957 and didn't start up again until June 1958 from when they were fitted with the new “Yashinon” named lenses (as well as the new 35 mm and cine cameras, there was the new Yashica 44 and Yashica 635 and re-branding of Yashicaflex models to become the Yashica B and D - Yashica was busy at this time). By then, the name may have been revised. If the Lumaxars and Yashinons came out of separate factories, it is extremely unlikely that such a match would have been successful or even possible. The Tessar optical design was pretty well standardised but even minor variations in optical glass used would require new computations to adjust for the different refractive indexes. I understand that the differences between German and Japanese optical glass are quite significant. There are posts on the net that claim Lumaxars are sharper than Yashinons, mostly by Lumaxar owners. There is also a Yashica TLR Unlimited group discussion on Flickr where several owners of both cameras with Yashikor triplets in good condition (the older the lens, the more chance that the rear element needs cleaning) and Yashinons find it difficult to tell which camera was used for which photo. Of course wide open and printed big enough, the differences become more obvious. However, I remain unconvinced that anyone can tell the difference between a Lumaxar and Yashinon photo even if a difference exists, or even between similar Tessars from different competent lens makers. The viewing Lumaxars are all f/3.2 as are the earlier Yashinons except the viewing Yashinons on the Yashica Auto and Yashica E which are f/3.5. The later viewing Yashinons, including those introduced with the 1965 Yashica 24 for CdS metered versions and Yashinons fitted to Yashica Ds and 635s from 1970, are f/2.8. The Yashica-Mat received the upgraded viewing lens at the same time as the Yashica D and 635 changed to Yashinons. I am 100% certain that all Lumaxar and Yashinon viewing lenses are three element triplets, and believe that is confirmed by tests in “Are all Yashinon Lenses 4 Element Tessar Types?” below. In true TLRS, the viewing and taking lenses are optically matched. In practice, that only means that they have the same matched focal length and viewing lenses have to be of reasonable quality to give an undistorted representation of what the taking lens is seeing. Googling will bring up a number of cross sections of Rolleiflexes showing triplet viewing lenses with 4 element Tessar type or more complex taking lenses. My understanding of Franke & Heidecke models is limited but I believe that nearly all of the viewing lenses including the Heidosmat lenses fitted to recent Rolleiflexes are triplets. In front of me as I write this is a Franke & Heidecke brochure for the late model Rolleiflex 2.8 FX with 5 element Carl Zeiss Planar lens. The “viewfinder lens” is described as 3 “uncemented elements”. The two automated Rollei Magic models are minor exceptions. Whilst still having a “Heidosmat” branded viewing lens, according to RolleiClub, they have matching 4 element 75 mm Schneider Xenar lenses top and bottom. This is because unlike all other Rollei (and Yashica) TLRs, focusing is by the lens front cell only - they do not have front panel focusing. Therefore, the lenses really do have to be identical. Yashima confused matters with mainly using the same name for viewing and taking lenses. Perhaps as a nod to differences between them, they did initially start with “View-Lumaxar” and “View-Yashinon” but then dropped the “View-” in 1964. It would be unbelievable to think that Yashima would opt for a higher specification than a more refined and expensive brand that it was seeking to provide an economy alternative to. Below left is part of a page from a Japanese brochure from 1957. The fact that the the viewing lens is an f/3.2 triplet is 100% clear (note, the camera shown is an early type with Copal MX shutter and 75 mm lenses whereas the description says 80 mm and other Yashica-Mat photos in the brochure are a mix with both 75 mm and early 80 mm lens types). On the right is a schematic that appears in a number of Yashica brochures from around 1964. The large third group in the taking lens is likely to be the cemented pair of a Tessar, although it is not shown that way. Note that the focus knob gives the impression of being on the far side and that there appears to be a Yashica Mat-LM or EM exposure meter. Either way, the viewing and taking lenses are different and match the outline of the groups in the first brochure. Lenses are f/3.5 60 mm Yashikors on the Yashica 44 and 44A and Yashinon on the 44LM. The mythical Auto 44 is reputed to have f/2.8 taking and viewing lenses. See also “Are all Yashinon Lenses 4 Element Tessar Types?” and “Putting 3 Element Yashinon Taking Lenses into Context” below. These cameras are well engineered, and it has to be said, pretty, but they were built to a price in a competitive market and the Yashica 44 was already considered expensive. If more proof is needed, Camera-wiki.org has details of the 1959 Yashica Future 127 prototype camera which is said to have a 3 element 60 mm “Yashinon” lens (the reference quoted is respected Japanese magazine Shashin Kōgyō). In the interests of complete disclosure, one German brochure, which appears to be published by the local distributor rather than Yashica, does claim that the lenses are 4 element. The only confirmed photo is in Sugiyama's book. The brief description states, “Yashinon - f2.8, 60mm”. I had always assumed that this referred to the viewing lens and the photo seems to confirm that the viewing lens is indeed f/2.8. However, I had ignored the obvious and that is that Sugiyama always quotes the taking lens aperture! Unfortunately, the aperture cannot be discerned on the taking lens, however, it is clearly special in that there is a lot more text than on other lenses including the Yashinons on the 44LM. The word “Yashica” is clearly visible (the only instance on a TLR lens that I am aware of) and I think that “Yashinon” is still there too. Based on documented evidence, I have already answered that in the negative but a more practical test would be reassuring. Without dismantling a lens, I believe that it is possible to demonstrate that Lumaxar/Yashinon viewing lenses and the Yashinon taking lenses on the Yashica Auto, Yashica E and Yashica 44LM are triplets. Note, that a 3 element “Yashinon” does not automatically mean “Yashikor” - see Triplets (Yashinon). 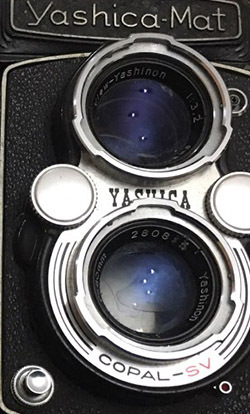 The genesis of my investigations was that at least two websites claimed that some 60 mm Yashikors have 4 lens elements (a ludicrous idea in terms of what I now know about 60 mm Yashinons), something I couldn't believe but thought that I might be able to test. The argument on the websites is based on the number of reflections that can be seen, 2 for each element so that 3 elements would display 6 reflections and a 4 element lens would display 8 reflections. The test was conducted on the taking lens with aperture wide open and shutter open on bulb. I tested a very early Yashica 44 with Yashikor lenses, a Yashica 44A with Yashikor lenses, a late Yashica 44LM with Yashinon lenses and as a control, a Yashica 24 with Yashinon lenses. I followed the procedures as I understood them. In each case, I could only find 6 reflections! That is simply because, as I read elsewhere, the test does work but 4 element Tessar types have a cemented rear pair still offering only 2 glass to air surfaces, not 4 so the reflections are the same as for 3 element lenses. Or so I thought. The prolific Rick Oleson (http://rick_oleson.tripod.com/tessar.pdf) will tell you that it is possible to see a faint extra single reflection from the cemented surfaces (that would make a total of 7, not 8) because there is a change in refractive index at that point (the reason for 2 cemented elements instead of a single one) but that the only way to see the reflection is to isolate the rear pair by removing the group from the camera or, second best, by leaving the shutter closed and looking from the rear of the camera. On the Yashica 24 with its bigger lenses, using fluorescent tube, halogen spot and incandescent light sources alternatively, I was fairly certain that I could see the third reflection but there was also interference from light reflecting from the aperture and/or shutter blades so that was still a little bit inconclusive. I was fairly confident that the Yashica 44 with Yashikors only had 2 reflections. The Yashica 44LM was a dilemma, for a moment I thought that I really could see 3 reflections but I couldn't subsequently reproduce that scenario. It was time for another attempt. My Test Procedure: I set each test camera to f/3.5 and Bulb. In daylight, in a dim windowless corner, I stood under a halogen down-light with me looking down at the front of the lenses which were pointed up to the light source. 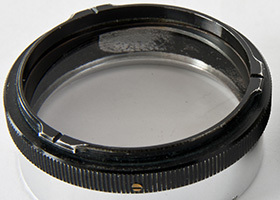 The focusing hood was left closed to provide a black background for the reflections. My Procedural Test Results: With 3 element Yashikor lenses, the reflections in the viewing and taking lenses were identical. There was a stack of 3 similar reflections, another stack of 2 similar reflections plus one brighter reflection. With 4 element Yashinon lenses, the reflections in the viewing lens were the same as with the Yashikor, both in appearance and the fact that only 6 reflections could be found. However, as predicted by Brian, there were two differences with the 80 mm Yashinon taking lenses. The second stack of 2 reflections was joined by a very, very faint (maybe small is a better description) third reflection but most noticeably, the single brighter reflection was much bigger than its counterpart in the viewing lens. This was by far the most striking difference. My Camera Test Results: The Yashikor taking and viewing lenses on a Yashica 44 and Yashica 44A tested identically with 6 reflections as expected from their specs. Surprisingly (at the time, I hadn't yet seen Yashica's 44LM brochure), the Yashinons on the Yashica 44LM also produced near identical reflections in both each lens and to the pattern of the other two. The results suggest that all the 60mm lenses are triplets, although not necessarily that the Yashinons are identical to the Yashikors. The 80 mm Yashica D Yashikors performed as expected, i.e., the pattern of 6 reflections were near identical in each lens and very similar to the pattern in both types of 60 mm lens. A Yashica-Mat with 80 mm Lumaxars and a Yashica 24 with 80 mm were also tested. These both produced near identical results to each other with the viewing and taking lens patterns differing as described above, i.e., the taking lens had a a very faint/small 7th reflection and the bright reflection was quite noticeably bigger. 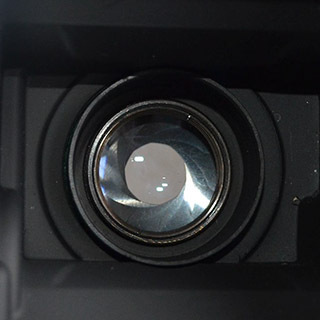 Therefore the 80mm Lumaxar and Yashinon viewing lenses behave as expected for a 3 element lens and the respective taking lenses behave as predicted for a 4 element Tessar type. Note that the elongated reflection in the Yashica 24 viewing lens shots directly above is from the rear edge of the lens assembly (clear from other full resolution shots) plus there are the inevitable dust spots too. Yashica Auto: Contributor Leigh Harris has performed the test on a Yashica Auto and has found a similar pattern to the Yashikor triplets. Yashica E: Correspondent Tony Waterhouse, who has been collecting and repairing Yashica TLRs for 10 years, has dismantled and overhauled his Yashica E and has confirmed that the lenses are indeed 3 element triplet types. The Yashica E presents a difficulty for testing in that it doesn't have a Bulb setting. Being a little more expert in reflections now and armed with Tony's information, I decided to attempt Rick Oleson's method again. This time, I could easily find 3 reflections for the Yashica 24 rear group (which confirms my rather more tentative first attempt noted above) but only 2 for the Yashica E (not originally tested with Rick's method). Yashica renamed their Lumaxar Yashica-Mat lens to Yashinon in 1958. 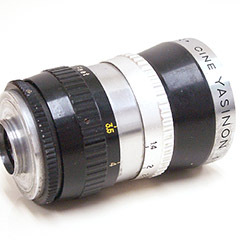 TLR enthusiasts and commentators have ever since equated the “Yashinon” name with the 4 element Tessar type formula. But what really happened? In 1957, Yashica released the Yashica 8 movie camera, in 1958 the fixed lens Yashica 35 rangefinder and in 1959, the first of the Nicca based rangefinders, the YE. I don't know much about the 8/8T cine lenses except that initially, they were Zunow supplied and branded with f/1.9 apertures, followed by new Cine Yashinons in early 1958 with f/1.4 apertures and then the Yashica 8S was fitted with an f/1.9 Yashikor that appears to be identical to the same spec Zunow. I doubt that Yashica named these Yashinons and Yashikors according to the number of elements per se, probably more about positioning in terms of performance and price. With the Yashica 35, the lens was a Yashinon f/2.8 or f/1.9. From Yashica's own brochure, the f/2.8 has 5 elements in 4 groups and the f/1.9 has 6 elements in 4 groups. The YE, a premium camera, was sold with an f/2.8 Yashikor and the subsequent YF with an f/1.8 Yashinon/Super-Yashinon. There are claims that the YE f/2.8 Yashikor is 4 elements in 3 groups, i.e. a Tessar design, and also that it is is a 5 element Xenotar design. In fact, a Japanese collector's magazine claims that there are two versions, one of each. Either way, it's not a triplet. There is also a rare f/2 5 cm Yashikor LTM mount that has been found occasionally with the YF model - sitting above the f/2.8 and below the f/1.8 Yashinon. 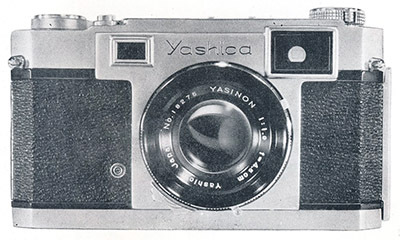 In this period, “Yashinon” seemed to be reserved for the more premium of the lenses and “Yashikor” for the more basic with no direct link to the lens design or number of elements, but then pretty soon, “Yashinon” seemed to take over as the brand name for all Yashica's lenses, although noting that there were some later budget M42 Yashikors too (with the TL-Electro, Yashica advertised four Yashikor lenses with total elements ranging from 4 in 4 groups to 7 in 6 groups). With the new cameras and branding ideas, existing models didn't change so we are used to the idea of Yashica Ds and 635s continuing into the late 1960s with 3 element Yashikors but many are not aware of Yashica, for instance, releasing the 35 mm Flash-O-Set in 1961 with confirmed fixed focus 3 element Yashinon. Rather than a specific intention to deceive, release of new TLR models from this period forward also featured the “Yashinon” name in line with the new practice. Some were Tessars as on the Mat-LM and EM, 24, 12, Mat-124 and Mat-124G and some were triplets as on the lower price Yashica Auto, Yashica 44LM and Yashica E. As a camera maker, Yashica probably saw no inconsistency with the rest of its range whereas half a century of commentary later, we with our 21st century rose tinted TLR glasses feel cheated by 3 element Yashinon triplets. But rather than blaming Yashica, perhaps it is reviewers and commentators who have raised our expectations to unrealistic levels in the past that are at fault. To put the value equation into perspective, the rare and pretty in grey Yashica Auto with crank wind, whilst expensive for collectors now, was two thirds the price of an otherwise identical Yashica-Mat. The Japanese market Yashica 44LM was more expensive than a Yashica 44 with Yashikors (14,500 yen compared to 11,800 yen) but as well as an exposure meter, it added other refinements including automatic frame start, just like contemporary 66 models. The export versions with red window and manual reset may have reversed the price difference - the 1959 Sears catalogue lists the 44 at US$68.88 and the 1961 catalogue lists the 44LM at US$59.99. The Yashica E was designed for the novice with a price only a fraction above the Yashica A (in some markets at least) whilst at the time, the more expensive enthusiast level Yashica D and 635 had to make do with Yashikors until 1970. So why would Yashica fit a 4 element lens to any of these and indeed, how could it afford to at a time when TLRs were already struggling against the 35 mm onslaught? Yashica was successful with its TLRs because it kept volume up and prices down - the margins were small. 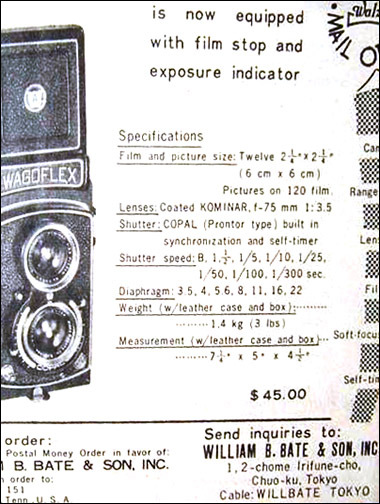 A circa 1964 brochure that I have downloaded from the net advertises the Yashica-Mat with “Yashinon 80 mm 4-element coated, color corrected lenses” (very unlikely to be correct for the viewing lens) and states that “the Yashica Mat-LM is exactly the same in all features, but includes a built-in uncoupled exposure meter”. The Yashica E is simply advertised with “matched Yashinon 80 mm f/3.5 lenses, color corrected and hard coated”. The Yashica 44LM uses the same description except substitutes 60 mm. The Yashica A, D, 635 and 44A use the same descriptions as the Yashica E and 44LM except with “Yashikor” substituted for “Yashinon”. Even the Yashica E brochure only says “YASHINON f/3.5, 80 mm matched lenses”. I have seen no official Yashica advertising material which claims that the Yashica E or Yashica 44LM have 4 element lenses (the only Yashica Auto ad I have seen is in Japanese) although there is one German 44LM brochure published by the local distributor which does make the claim. Why doesn't this get mentioned on other sites? As noted, at least two Japanese sites have picked up on it. They probably know a thing or two and don't have to rely on Google translations. Yashinons were first released as 4 element Tessars and I think that with clever marketing relying on vague details, assumptions have been made and repeated ever since. The type/size of mount fitted to each model is identified in the table at the top of their respective entries on the 66 Models and 44 Models pages. The filter mounts on the original models and most of the budget Yashicaflex A series models plus Yashica Rookie and A were plain push-on 32 mm types. The Yashicaflex A2, Yashicaflex A (new model) and Yashica B have plain filter mounts but with a cover plate or faceplate over the shutter like Bay 1 models. These three have plain 36 mm push-on mounts. An earlier camera with the cover plate, the very rare Yashicaflex A-III, still has the standard 32 mm mounts. The Yashica 44A has smaller 28.5 mm plain mounts. There is also a single fixed pin, visible to the left of the bottom spring pin in the two photos below to provide a positive stop once the accessory has been rotated clockwise. Yashica Bay 1 lens hoods make use of the external bayonets. The hoods have a spring loaded washer to provide positive securing grip so the action is to push and turn and there is also some sort of positive stop, although I'm not quite sure how that works. There is more about Bay 1 mounts and their issues in Accessories, Yashica TLR. There is also an interesting anomaly. The photo of the Bay 1 mount on the left belongs to the first Yashica Flex model S with Copal shutter in my database. The internal pin alignment seems to be the same as Franke & Heidecke models and the same as earlier Yashica Flex model S examples with NKS shutter, late Yashicaflex model S examples with the new long strap holder body style and all other Yashica models with Bay 1 mounts and probably all Bay 1 mounts by other makers. However, my example of the Yashica Flex model S still with early body but new style graphics already, serial number 30769, only some 500 cameras later than the left example, has a different pin alignment. Instead of the pins being aligned to the left of the top slot, they are aligned to the to the right. The pair below look like mirror images but note, the text is not reversed. The only other example I have been able to find is the next camera in the database, 308xx, so it was certainly a short-lived experiment. Normally, you mount the accessory and twist clockwise approximately 90 degrees. With the different alignment, the twist is still clockwise to lock but the rotation is only the width of the tab, maybe approximately 30 degrees. Perhaps Yashica was trying to improve on the Rollei design but whilst it doesn't matter with some accessories, it does render the parallax correction of the Yashica close-up sets useless. 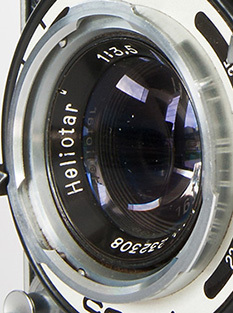 It is possible to use the hinged metal lens caps (not original to this model) but they have to be rotated anti-clockwise. The Yashica E is unique with a 52 mm screw-in filter thread around the outside of the selenium cell. Unlike for all other models, there is no provision for fitting accessories to the viewing lens. Bokeh is a complete subject in itself and to a large extent it is very subjective and depends on what is pleasing to the individual. I don't intend to discuss it other than to mention certain features of Yashica TLR models that affect it one way or another. I might add that I have seen few complaints with regard to Yashica TLR bokeh but neither have I seen raving praise. I take that to mean that the bokeh can generally be considered pleasant but not something to die for. Sometimes bokeh is taken to mean how the out of focus highlights are rendered, largely determined by the shape of the lens aperture which in turn is affected by the number of aperture blades. 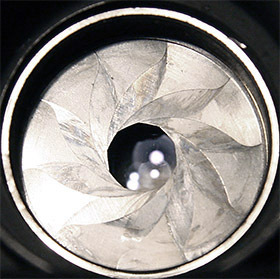 For example, just like the Franke & Heidecke cameras, some Yashica models have 5 bladed apertures, which can result in pentagonal shaped out of focus highlights, and others have 10 blades which result in more circular highlight rendering. The following section on shutters has more detail. It should be noted however, that shooting wide open when the out of focus highlights have the greatest impact (at the shallowest depth of field), the aperture blades are withdrawn from the light path and the aperture is effectively circular. Also, both 5 and 10 bladed apertures in Yashica TLRs have curved blades, although as the aperture size decreases, the pentagon formed by the 5 blades becomes more accentuated. Most definitions of bokeh are more complex but in some respects, also more subtle. As well as highlight rendering, whether the bokeh is pleasing or not can be affected by the particular foreground and background detail, lighting and colour. The traditional Japanese appreciation of bokeh is also very much related to tonal gradation. Apparent sharpness and resolution of a lens do not necessarily contribute positively to bokeh, in fact in some circumstances, they can be detrimental. It also depends on the priorities of the lens designer. One form of bokeh which seems to be sought by some for some subjects and avoided by others is often called “swirly bokeh”. The reality is that this effect is the by-product of less than perfectly corrected lenses. It is most commonly found in triplet type lenses but less so in Tessar types. 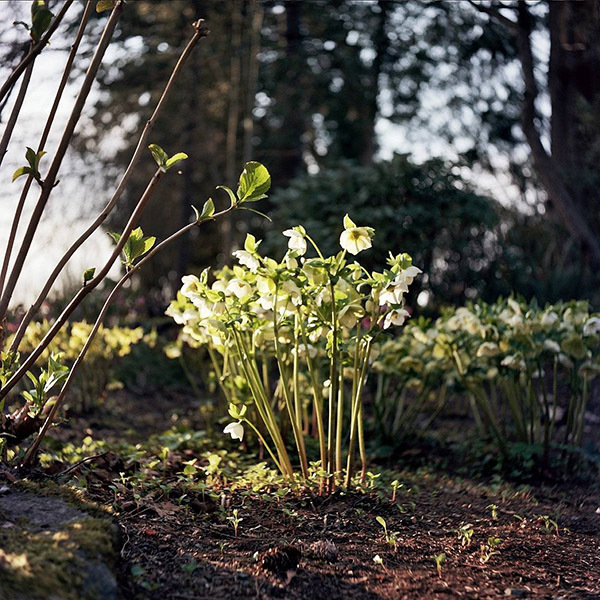 For the full-size image and more great examples, see Bill's “Testing a Yashica TLR Camera After 55 Years in Storage”. An example of the smooth bokeh of a Yashinon fitted with close-up lens can be found in One User's Experience. The table below lists all the shutters, including variations, fitted to Yashima/ Yashica TLRs. Apart from perhaps the single speed Yashica E shutter, the origins of which are uncertain but could be Yashica itself, these were all bought in from specialist suppliers. Unnamed shutter models are not known to have a model designation. Note 1: Yashima specs list the Yashicaflex A-III as having a “Seikosha Rapid” shutter with “Flash Synchronization (MX)” whereas the one found example is fitted with the “Seikosha MX”, my understanding being that this is what a Rapid with MX sync is called. In any case, the shutter has a switch for M, F and X sync delay with “F” being for short duration flashbulbs. Note 2: Two 1961 Yashica-Mats with close serial numbers (plus a third mentioned in a forum) have been found with "SV" marked on the faceplate, see “A Most Unusual Camera and Shutter”. Copal SV & MXV shutters seem to operate more or less identically and use similar/same parts when configured the same but the SV is more flexible in terms of what features are requested by the camera manufacturer. 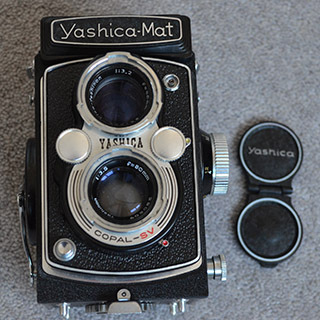 All Yashima/ Yashica TLR models use leaf, or diaphragm shutters as they are also called. Early and basic models use what are commonly referred to by some as “rim set” types based on the shutter speed being changed by rotating the bezel but later types hidden under covers and sometimes adjusted by control wheels use linkages to basically operate the same way. As lenses with leaf shutters form a discreet unit with the shutter fitted between lens elements, it is often said that “x lens is in a y shutter”, e.g., “Yashikor lens in a Copal MX shutter”. In Yashica TLRs with triplet lenses, the shutter is between the second and third (inner-most) lens element. With the Tessar types it is between the second and third element also, the third and fourth elements being a cemented rear pair or group. I'm not a shutter expert but it is claimed by others that most/all Japanese leaf shutters were copies of either the German Gauthier made Prontor or F. Deckel made Compur types (separate companies with significant Zeiss shareholding in each and eventually both owned and merged by Zeiss). For example, it is said that Copal shutters are influenced by Prontor and Seikosha by Compur. At different times, Yashima/ Yashica used different models from (or branded) NKS, SYK, Y.S.K. (logo is “Y.S.K”, all full stops included in a Japanese ad for the A-II), Copal, Citizen and Seikosha (Seiko of Seiko watches and Seiko Epson these days, no link to Seiko Electric Industries, the original maker name of Sekonic exposure meters). The last three companies are relatively well known. Copal exists today as Nidec Copal Corporation, having been acquired by Nihon Denshi in 1998, and amongst its portfolio of products, produces shutter assemblies for digital cameras. Until quite recently, it continued to manufacture leaf shutters for large format cameras. In the 1950s, it was called Copal Koki Co,. Ltd. Copal shutters were first used by Yashima at the end of 1954, or beginning of 1955, and exclusively in models released from 1958 on. NKS shutters, said to be a copy of a Prontor II, were made by Nippon Kōsokki Kōgyō, maker of Taron cameras (Camera-wiki.org). They were widely used by many of the smaller Japanese camera brands and Yashima used NKS shutters on its first four models although, the earliest example of a Yashimaflex has been found with an SYK shutter. I can find no reference to such a shutter anywhere at all although the letters could be related to pre-War S.Y.K Palma cameras made by Kyūreidō (Camera-wiki.org). Until Tom Heckhaus sent me a picture of his early Yashicaflex A-II, I was blissfully unaware of the Y.S.K. brand. More examples have come to light and it is now clear that it was also used on the first Yashicaflex A-I examples. The only other camera that it has been seen on is the Semi Renky made by Rengō Kōki. Examples and the little that I have found out can be found in the “Yashicaflex A-II” entry on the 66 Models page. Specs are the same as for the equivalent Copal. Early versions of the Yashicaflex A series cameras, the models A-I, A-II, AS-II and MolfoReflex (and presumably the unseen AS-I) were fitted with basic rim set shutters (first Y.S.K. on the A-I and A-II and then Copal on all) with a cable release socket where the push button release is on later cameras and other models and a direct acting lever at the bottom of the shutter, see Cable Release and Press Button Shutters. Note that depending on the shutter, aperture scales can be upside down compared to others (e.g. early and basic Copal compared to NKS, Y.S.K. and even Copal MXV on late Yashicaflex A2 examples) and speed and aperture scales can be reversed (Copal compared to NKS-FB on Yashica Flex S). Note that the Yashica A and 44A with their more basic Copal shutter and limited speeds starting at 1/25, did not change. 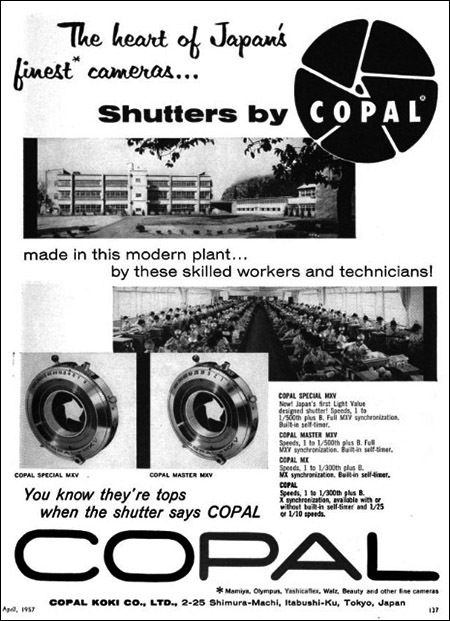 Copal started in 1946 as a private venture to design a shutter for the still-born Nippon Kōgaku (maker of Nikon cameras) Nikoflex TLR project. According to Camera-wiki.org, its first commercial application was on the Olympus Chrome Six folding camera after the model's initial introduction in 1948. As they apply to Yashima's models, I interpret Copal's 1957 models thus. The plain Copal shutter can vary from quite basic to similar to the MX in specs except it has no M flash sync provision, only X sync. In its most basic form, it is fitted to the the Yashica Rookie and Yashica A released in 1956 and has the 1/300 top speed, low speeds starting from 1/25 and no self-timer. The same shutter is used on the 1957 Yashicaflex A (new model) and its clone, the 1958 Yashica B, but with self-timer now added. An earlier version of this shutter with 1/200 top speed was used on the Yashicaflex A-I, A-II, AS-I and AS-II models, initially in cable release form, then with press button. Like the Yashica A and Rookie, there is no self-timer, however, slow speeds started at 1/10. This same shutter, with more components installed, is used on the 1955 Yashicaflex S and C. These were Yashima's premium models and in those applications, the shutter features a full range of slow speeds down to 1 second, a top speed of 1/300 and a self-timer. I don't know how much of the Copal MX was new, but specs-wise at least, it matches the top spec plain Copal and adds provision for lever selectable M sync added to the standard X sync. The shutter delay for M sync was incorporated by utilising the self-timer escapement so that M sync and the self-timer could not be used simultaneously. This implementation and weak lock-out design would plague this and subsequent Copal models including the SV. Top speed is still quoted at 1/300 and there is a full range of low speeds and self-timer. These shutters appeared on the Yashica C and LM in 1956. 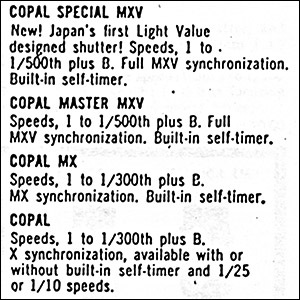 A version of the MX with 1/500 top speed (not mentioned above) is found on the first Yashica-Mat examples. 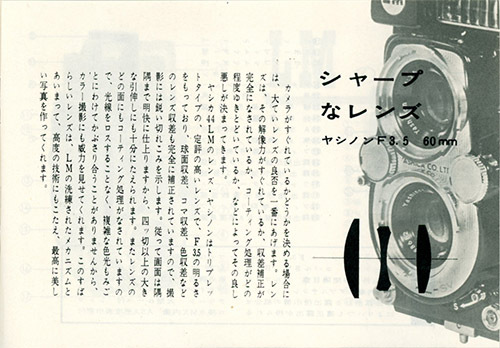 Below left is a drawing of a Copal shutter from the 1957 Japanese language Yashica-Mat user manual and on the right, an image of the shutter on the Yashica-Mat page of a slightly later 1957 Japanese brochure. The shutters appear more or less identical but there is no way of knowing whether one or the other or both are MX or MXV types. In the ad above, the Copal Master MXV is quoted as having “full MXV synchronization” as opposed to simply “MX synchronization” on the lesser model. What does that mean? M and X are flash sync delay settings. “V” is commonly found on German shutters and indicates “self-timer”. As we have seen, both the basic Copal and Copal MX were already available with self-timer so what was the real change? Or was it simply a marketing ploy to invoke the name of the famous German “Synchro Compur MXV”? 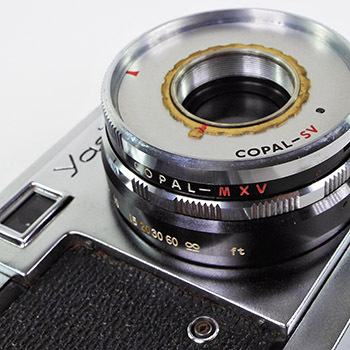 In the same vein, the later Copal SV, first used on the Yashica 44 in 1958, seems to allude to the Compur competitor, the almost equally famous “Prontor SV” and in which case “S” signifies flash sync (the Prontor naming doesn't differentiate between M and X sync) and “V” again means self-timer. In Copal MXV vs SV further down, the evidence suggests that the Copal MXV and SV share the same basic design and even some of the components but that the SV offers a more flexible modular assembly for different configurations. Certainly, the model names shouldn't be considered to indicate different features as they did on their German namesakes, particularly regarding presence of self-timer or not or which German type may be the influence (undoubtedly, the Prontor for all Copal variations). The shutter assembly also contains the aperture mechanism. This is located behind the shutter blades, except in the Yashica E where it is in front, and therefore for all models except the Yashica E, the aperture blades/iris can only be viewed from the rear of the lens or with the shutter open on bulb. The maximum aperture of the taking lens is determined by the lens design but with common leaf shutter arrangements, the narrower apertures (bigger numbers) are determined by the shutter design. All shutters on Yashica TLRs have apertures marked with the “modern” progression f/3.5, f/4, f/5.6, f/8, f/11, f/16 and f/22. 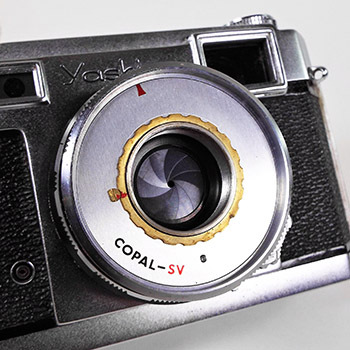 Copal SV shutters on 66 Models from the 1965 Yashica 24 onward add f/32. Note that the apertures are continually variable and there are no click stops so that the markings are nominal only. The one variation with apertures is whether they have 5 or 10 blades. In either case, the blades are curved. All the early Yashica TLRs have 10 blades regardless of shutter make or type. All TLR models fitted with Copal SV shutters have apertures with 5 blades (except Bill Walker's 1961 Yashica-Mat and one other, more details below). These include the Yashica 44 and Yashica 44LM introduced in 1958 and 1959 respectively and the following cameras introduced from 1965 on; Yashica 24, Yashica 12, Yashica Mat-124 and Yashica Mat-124G and 124B. The Yashica E also has a 5 bladed aperture. Earlier Yashica TLRs fitted with Copal MXV shutters definitely have 10 blades. These certainly include Yashica-Mats, Yashica Ds and Yashica 635s made until at least the mid-1960s, possibly up to late 1968, and all Yashica Mat-LMs and EMs. The more recent Yashica production of models with Copal MXV shutters, including all those fitted with f/2.8 Yashinon viewing lenses (i.e., those made after mid-1970) and some still with f/3.2 Yashinon viewing lenses and f/3.5 Yashikor lenses, possibly all those from late 1968 onward, also have apertures with 5 blades. Photographs of Yashica Ds confirm that. Contributor Leigh Harris has confirmed that his late Yashica-Mat with f/2.8 viewing lens has a 5 bladed aperture and I have photos of two others. Leigh has also confirmed that the minimum aperture on his late Yashica-Mat is still f/22 rather than the f/32 of the CdS models with SV shutters. Both apertures are set at f/11. Even with curved blades, the 5 blade type has a distinctive pentagonal shape. However, in case later model owners feel short-changed, Rolleicord models I to IV have 10 blades, later models V, Va and Vb have 5 blades. I am not very familiar with Rolleiflex specs but understand that the 2.8D and later cameras also have apertures with 5 blades. On Rollei forums, owners with 10 blades feel superior bokeh-wise and those with 5 blades, and perhaps superior lenses, play down the importance. I have also found reference in a Flickr Yashica-Mat forum to someone discussing a similar camera. Unlike the later CdS exposure meter models, the minimum aperture is f/22 like the MXV shutters as are the 10 aperture blades. At this stage, I am convinced that this is a 100% genuine Yashica produced anomaly of some sort and that the very well looked after camera matches its equally well looked after original packaging and kit. As detailed in “Copal MXV vs SV” below, the SV can be configured to be virtually identical to the MXV so operationally there should be no difference to other Mats. The taking lens number is less than 10 different to Bill Walker's camera (body number not visible). Finding a second example is very significant from a provenance perspective but it doesn't help with answering any of the questions. 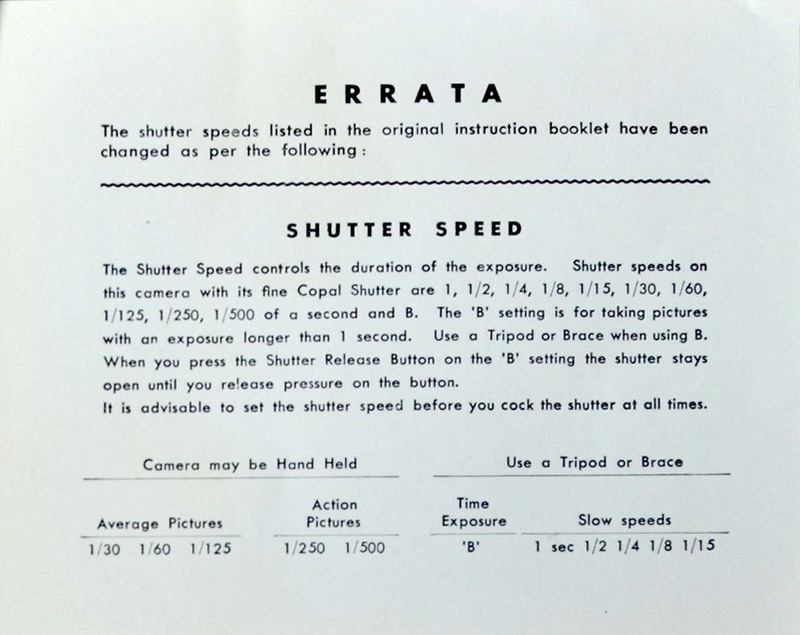 As used on Yashica TLRs, maximum and minimum shutter speeds, apertures (except minimum apertures on CdS models) and flash sync specifications of the two shutters are identical. My understanding has always been that Copal MXV and SV shutters are very similar but that the SV has been described as having fewer parts. Until Bill Walker's Yashica-Mat turned up, there seemed to be a correlation between “fewer parts” and only 5 aperture blades on the SV compared to 10 blades on the early MXV shutters. However, the reality is that there are SV shutters with 10 bladed apertures found on 35 mm models. The MXV was a development of the earlier MX and first appeared on the Yashica-Mat in 1957. 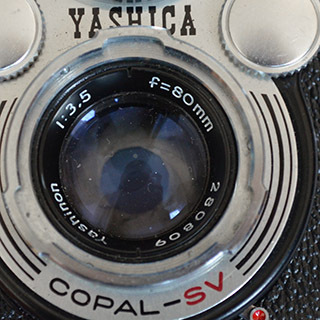 The SV first appeared on the Yashica 44 in 1958 but wasn't generally used on 66 models until the Yashica 24 in 1965. Of the three Yashica 35 examples found with the front lens block removed, two are fitted with the SV shutter (one early, one late) and one with MXV. There could be a number of explanations but the simplest may be one of supply and substituting what both the shutter and camera maker perceived as an identical, or at least equivalent, type. It seems to me that the original MXV and SV are basically the same shutter but that the SV offers configuration flexibility for the camera maker's particular application. An early example of the different positioning possibilities of the two shutters is the 1958 Beauty Super II 35 mm rangefinder camera. It was available with a f/1.9 lens and Copal MXV shutter with 10 aperture blades or, in cheaper f/2 and f/2.8 versions with Copal SV shutter with 5 aperture blades (camera-wiki.org). In Copal Shutters above, I have suggested that “MXV” was likely borrowed from Compur and “SV” from Prontor even though both shutters are almost certainly based on the Prontor design. In the 1950's, quality and design wise, Compur was considered number 1 and Prontor number 2. Originally, Copal perhaps thought that its customers would simply choose the MXV where the top spec was needed and anything less would be a suitably configured SV. However, over time, the SV seemed to replace the MXV completely. 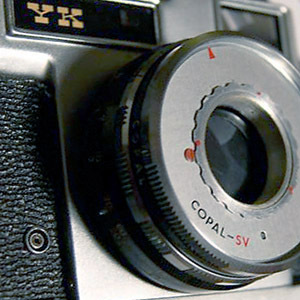 Most of the 35 mm fixed lens rangefinder cameras from the early 1960s, especially those with some level of linked or automated exposure control, adopted the SV shutter and that is where Copal's development focus seemed to be. In the context of the Yashica CdS models, coupling of the exposure meter to shutter aperture and shutter speeds may have been the main consideration for the choice of the SV. The 5 aperture blades on late model Yashica TLRs with “MXV” on the faceplate does beg the question of whether Yashica moved to the SV shutter of its CdS models without changing the shutter name on the camera, either as a cost-cutting measure, or perhaps because the MXV was no longer going to be available. That way, new faceplates were not required and manuals, brochures and other advertising material did not have to be updated. Remember, that is a question, not statement of fact. On the other hand, there is some precedent with the 1958-1960 Yashica 35 examples. 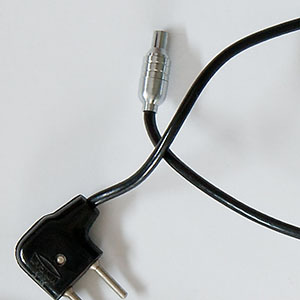 It used to be the case that flash sync sockets were not standardised until the world slowly adopted the German Prontor-Compur type, hence “PC” socket. The Pigeonflex and Yashima Flex used the ASA type with spring loaded pin in the centre and positive bayonet coupling. This is most commonly found on US made cameras and is sometimes called the “Kodak ASA” type. Both the Yashica Flex model B and Yashica Flex model S started with the ASA socket before changing over to the PC type early in their production runs (near the change from Tri-Lausar to Heliotar lenses on the model S but still with NKS-FB shutter). In the oldest English language Yashica Flex model S brochure found, Yashima still refers to “Standard ASA connector”. 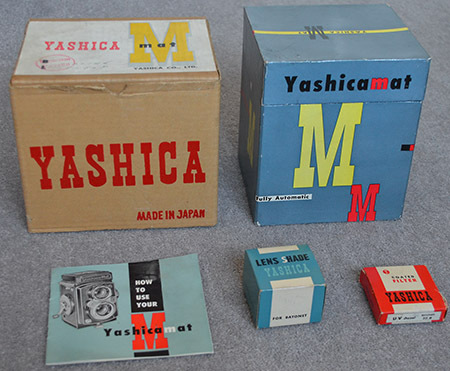 In the slightly later early Yashicaflex A series literature, Yashima refers to both “German type” and “European type”. Early examples have the sync low down on the spool knob side. 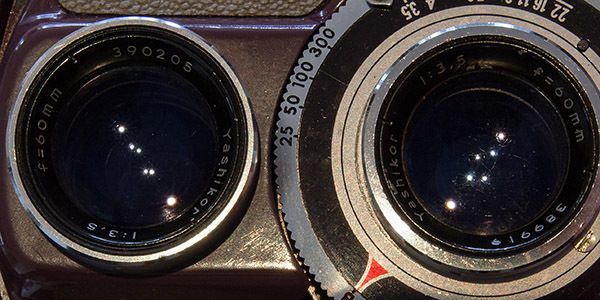 From late 1955 or early 1956, the sync on 66 models moved to the front on the right hand side of the focusing panel when looking at the camera, near the top corner for most models (top left for the early Yashica E) and near the bottom corner for the Yashicaflex A series (A-I, A-II, AS-I and AS-II), MolfoReflex, Yashica Rookie, Yashica A and the late version of the Yashica E.
Generally, on the various Yashica TLR models, shutter sync is commonly referred to “X” or “M/X” where the “X” means electronic flash (Xenon) and the flash fires at the peak of the shutter opening and “M” means medium duration flash bulbs which require the burn to start 20 to 25 milliseconds before the shutter is fully open (sync is usually set at 20 milliseconds). Shutters with combined “M/X” capability have a sliding lever to change flash settings from one to the other. The features sheet that came with my earliest Yashica Flex model S explains that the NKS-FB shutter has synchronisation for “F Class” (I believe that the later version with Copal shutter was “X” sync). F Class are short duration flash bulbs requiring a 5 milliseconds delay (information based on Wikipedia). Note that no sync speed is quoted. Cameras earlier than the Yashica Flex model S may have also been “F” sync, maybe the “FB” in the NKS-FB shutter is a clue, but may also have been “M” or some other unspecified sync (more likely for NKS and NKS-TB shutters) so I have generally referred to them as having a sync socket without quoting the type. 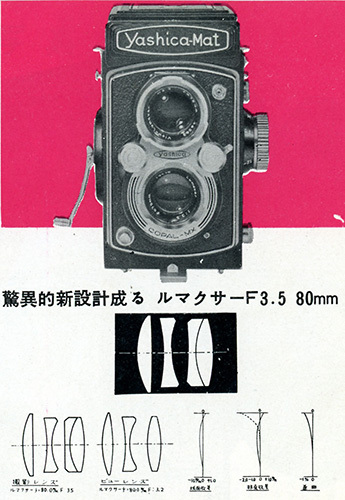 The first English language manual for the Yashicaflex model A (A-I and A-II) still depicts a Y.S.K. 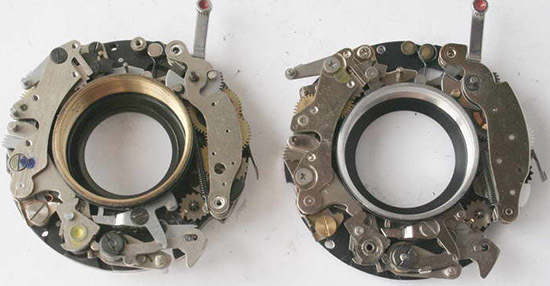 shutter and states, “German type Flash Synchronization Terminal (X). Synchronization up to 1/100 sec.” The slightly later model AS (AS-I and AS-II) manual states the same but depicts the Copal shutter. Both manuals illustrate flash use with Minicam flashbulb flashguns. The simple truth is that rather than X sync being optimised for electronic flash, it was instantaneous and straightforward to implement. Flashbulbs ideally require to start their burn before the shutter fires, something facilitated by the self-timer escapement on Copal shutters but missing from these budget versions. Manuals for models with M/X switching quote that “M” class bulbs can be used at any speed. Other manuals note that “Short Peak” bulbs (F Class) can be used on X sync at either 1/50 sec or 1/60 sec (depending on shutter progression) and “Medium Peak” bulbs can be used on X sync at either 1/25 sec or 1/30 sec. The Yashica Mat-124G manual explains that electronic flash and “M” class bulbs can be used at any speed but “F Class” bulbs are limited to 1/30 sec. or slower. The late Yashica D manual with “66” on the cover is similar. If in doubt, read the relevant manual but cameras with X sync should be OK at any speed with electronic flash. Flash bulbs are trickier. Even though Copal shutters have a lock-out to prevent using the self-timer on the “M” sync setting, this often either seems to fail or photographers are cleverer than Copal engineers. DO NOT USE “M” SYNC TOGETHER WITH THE SELF-TIMER see also the “Ownership” section.